The end of August is bittersweet for me. I really dislike summer ending but I love when veggies come in season and I can eat all the FRESH veggies! It is also my time of the year to freeze fresh grown veggies to have all winter. Yesterday was my Pepper Day. I purchased a bushel of peppers from our local farmer to freeze for winter. Freezing peppers is so easy! 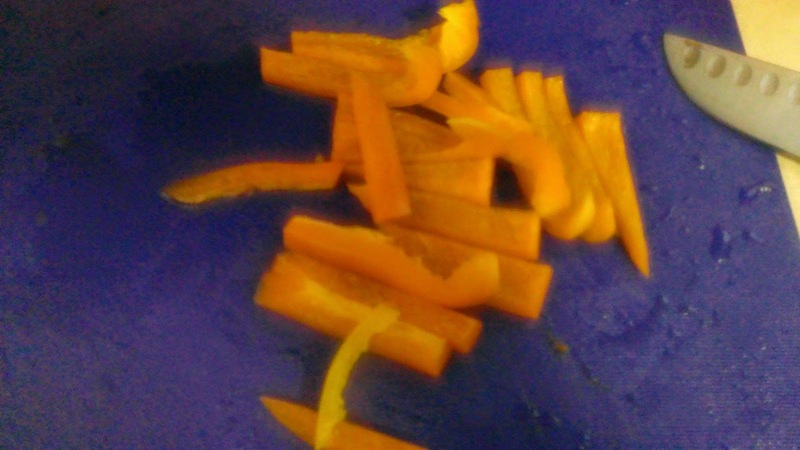 Wash - remove seeds and stems - slice - pack in bags - freeze! 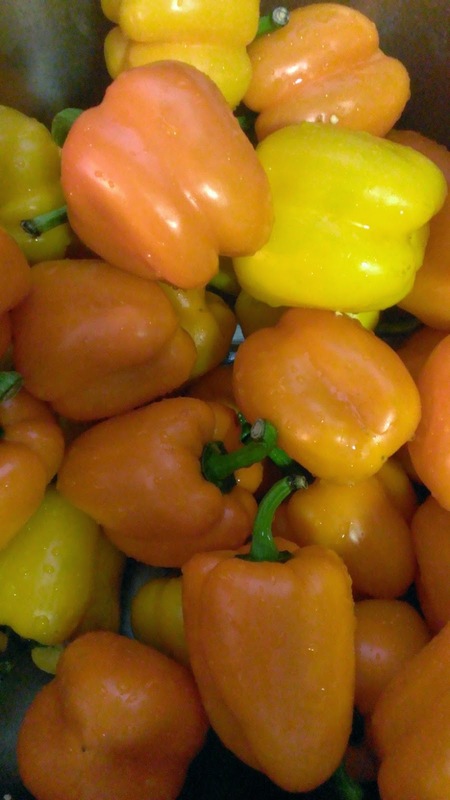 I froze 4 gallon bags of yellow and orange peppers - I got a fantastic deal from the farmer - a full bushel for only $10. I also froze one gallon bag of sliced Banana Peppers - we love them on pizza and burgers. This year my Banana Pepper plant in my garden grew really great - one plant grew enough peppers for me to freeze. I had a special helper Isa. She helped me wash and pack the peppers. I did the slicing and she did the packing. It is amazing how fast we were able to freeze the whole bushel. 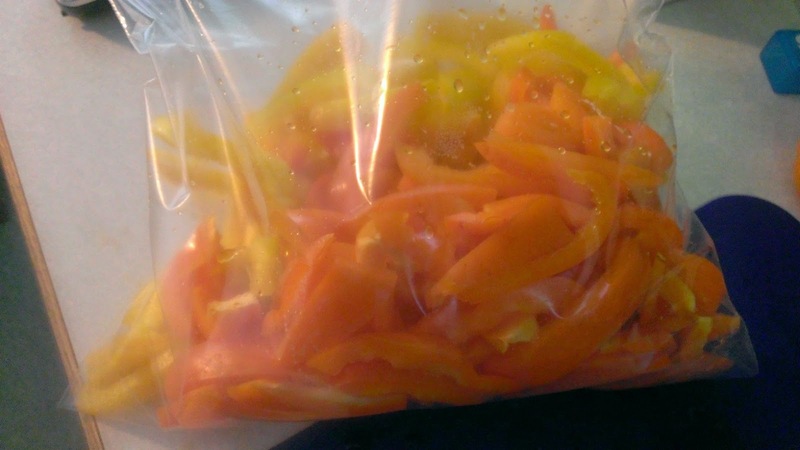 I freeze my peppers in gallon freezer bags. I keep one bag in the freezer in the kitchen to use when needed. I keep the other bags in the freezer in the garage. I use the peppers to cook so many different meals. They are great taken out in a handful and used in omelets - scrambled eggs. We love Italian Sausage with sauteed peppers. My hubby makes a delicious Pepper Steak. Freezing locally grown veggies is a great way to eat healthy all year long and also be very cost saving. To purchase yellow peppers in January they cost about $1.99 each - a price I will not pay. Not to mention the peppers I froze are organically grown - they are not full of chemicals or coming from outside the USA. They were grown in Wisconsin - right down the road at my favorite farm.